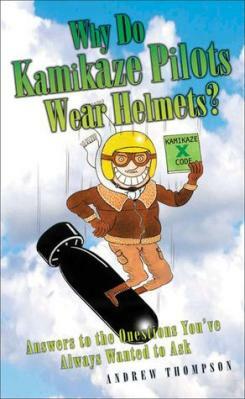 HOME > Books > Related Topics > Why Do Kamikaze Pilots Wear Helmets? The subtitle describes the book's contents as answers to the questions you've always wanted to ask. The author provides short answers, often with humor, to 200 questions on an extremely wide variety of topics. The questions provoke a reader's curiosity, and the answers directly address them in an easy-to-read style. Kamikaze is the Japanese word meaning divine wind, named after a typhoon that is said to have saved Japan from Mongol invasion in 1281. After the attacks of the Japanese air force on the Allies' ships in World War II, kamikaze has universally come to mean a suicide pilot. Towards the end of the war the Allies began advancing towards Japan, and Japanese aircraft were often outnumbered and outclassed, resulting in a scarcity of adept pilots. At the same time, the Japanese airforce was assigned the task of assisting the Japanese ships in the Leyte Gulf. The task was larger than could be accommodated, so Vice Admiral Takijiro Onishi formed a Kamikaze Special Attack Force. There were many volunteers to be pilots, but experienced and valuable pilots were turned away, with most kamikaze pilots being young university students. Ceremonies were often held before missions, in which the pilots were given medals of honour. Approximately 6,000 Japanese soldiers died in the kamikaze missions, and all are thought to have been volunteers. Given that they knew they were to die, people sometimes wonder why kamikaze pilots wore helmets. In fact, the helmets weren't worn to protect the pilots from dying, but to protect them from injuries during the flight so that they reached the target, to keep their heads warm and because the helmets housed radio earphones. The helmets merely helped the pilots to complete their missions because the helmets were necessary to pilot the aircraft. In addition, many missions were unsuccessful and if this was likely, pilots were encouraged to return to base and the helmets assisted with this. Many say that the pilots didn't wear helmets at all (and no pilots did at that time), but merely wore leather flight caps and goggles, but that these were worn for the same reasons – to help the pilot complete the mission. Kamikaze pilots wore the same flight suits, including flight helmet (or maybe more appropriately termed "flight cap"), as any other Japanese Navy and Army pilots at the time. They clearly had nothing to do with protecting kamikaze pilots in a crash into a ship or any other type of crash. The second paragraph of the answer has a couple of inaccurate statements about Japan's kamikaze pilots in World War II. Although short farewell ceremonies were often held prior to taking off, the kamikaze airmen did not receive any medals at that time. They usually did receive a promotion of two ranks after they died as part of a tokko (special attack) mission. Some kamikaze pilots were not volunteers, despite the answer's assertion that all were thought to have been volunteers. Although probably the majority of pilots volunteered, numerous Japanese sources state that kamikaze pilots in certain units were ordered to join the tokkotai (Special Attack Corps) with no request for volunteers (refer to Note 5 of book review of Fire From the Sky: Surviving the Kamikaze Threat). There were about 6,000 Japanese men who died in suicide attacks as members of the Special Attack Corps. However, only about 4,000 persons were Navy and Army airmen. The other roughly 2,000 men who died used explosive motorboats, special submarines, and kaiten human torpedoes. How do flies land and walk upside down? Why do people get dizzy if spun around? What are rainbows and how are they formed? Did Robin Hood actually exist? What are the JFK assassination theories? Is Caesar salad named after Julius Caesar? Why is a dollar called a 'buck' in the US? What is the origin of the term 'OK'?